More than half a year after the bankruptcy of Armenia’s national air carrier Armavia the next company seeking to become the nation’s airline operated its maiden passenger flight on Wednesday. Meanwhile, at its government session the same day the Armenian government made a decision on the liberalization of the aviation market. 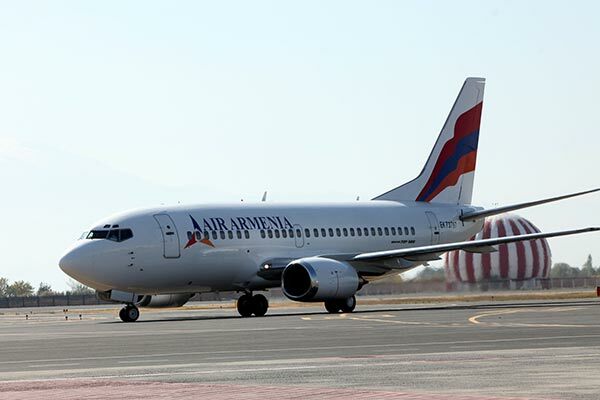 Air Armenia, which was established in 2003 as a cargo transportation aviation company, conducted a charted flight from Russia’s Rostov to Yerevan on board a Boeing 737 aircraft. The solemn reception of the flight ushered in the start of the operation of Air Armenia as a passenger airline. “As we know, the national air carrier, Armavia, stopped operating flights on April 1, and at that moment there was no other Armenian air carrier that could operate those flights. Our work in recent months has been aimed at making preparations for passenger flights,” said Air Armenia co-owner Vahan Harutyunyan, who added that by the end of the month the company will also get an Airbus 320 aircraft by leasing and will continue to develop its staff. Harutyunyan also said that in this year’s winter schedule they envisage flights in six destinations in Russia: Moscow, St. Petersburg, Samara, Sochi, Krasnodar and Rostov. But work, he added, will be done to operate regular and charter flights to other destinations as well. On Thursday Air Armenia was scheduled to make another charter flight, this time to Brussels, and the passengers of this flight were to be Armenian Prime Minister Tigran Sargsyan and his delegation heading to the Belgian capital. The airline’s regular flights to Moscow are scheduled to start on October 27. For many years Armenia’s civil aviation has depended on one national air carrier, however, when Armavia became bankrupt and stopped operations earlier this year, the Head Department of Civil Aviation of Armenia issued a license to Air Armenia for passenger transportation, and the authorities declared about a partial liberalization of the sphere. National Competitiveness Foundation Director Arman Khachatryan said that after liberalization any airline that meets certain technical criteria will receive a license without impediments. Leader of the group for the implementation of this project, Economy Minister Vahram Avanesyan said that the government’s decision on full liberalization of the aviation industry in the mid- and long term may lead to a 1-2 percent economic growth. This is based on the assumption that the number of operated flights will increase by 20-25 percent. As for having a national air carrier, the economy minister said that usually for small countries it is difficult to have a national air carrier, as they are rarely profit-making. Meanwhile, member of the aviation subcommittee of the Public Council Levon Ghazaryan told ArmeniaNow that having a national air carrier is a national security issue for Armenia. “As a result of this liberalization, foreign companies will simply use the Armenian market for making profits and Armenian airlines will not have an opportunity to grow or even survive,” argued Ghazaryan.